Charm Sprites are a fun method of training Hunter for medium to high leveled hunters.The reward from this activity is not only a nice hourly rate of Hunter experience, but also the valued charms used in the Summoning skill. Once activated, the Eagle's Peak Loadstone can be used an unlimited amount of times. This is the simplest method to reach the Charm Sprites. After completion of the Tree Gnome Village and The Grand Tree quests, the use of the Spirit Tree is available. 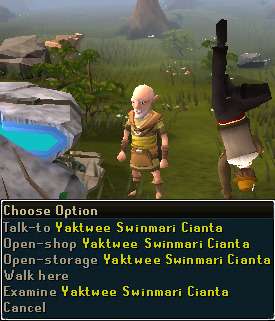 To teleport from the Tree Gnome Stronghold tree, The Grand Tree quest is required, but to teleport to it, the Tree Gnome Village quest is required. After the Enlightened Journey quest and unlocking the Gnome Stronghold method, with 75 Firemaking and at the cost of 1 Magic Log, the Hot Air Balloon can be used to transport to the stronghold. This method is time consuming and costs the price of a Magic Log, so it isn't highly recommended. After completion of The Firemaker's Curse quest, you can use your Book of Char to teleport to the cave close the Sprites once per day. This is the fastest route of access, albeit less than a minute faster than the Lodestone. 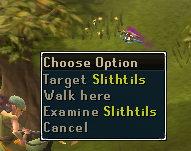 You only need two tools to begin Charm Sprite hunting: The Yaktwee Stick, and the Spirit Lure. Both can be purchased from the not at all oddly-named gnome at the cracked dolmen. Yaktwee also offers storage space for your stick, lure, and charm slices, so that you don't have to waste bank space on them. 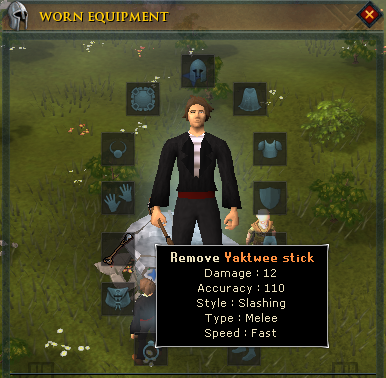 The Yaktwee Stick is a weildable weapon, with low melee capabilities. It is used to transmute the Charm Sprites into Charm Slices after they are lured from the Neverberry Bushes using the Spirit Lure. There are three types of Vizzy Critters, called Gleaelg, Tranart, and Slithtils. Catching a Charm Sprite is quite simple. First, you target a Neverberry bush. 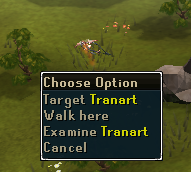 In doing so, your character will throw your spirit lure onto the ground next to the bush. Then, you target the lure which will cause one, two, or three Charm Sprites to appear. 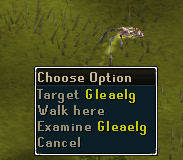 If one spawns, it will always be a Gleaelg. If two spawn, it will be a Gleaelg AND Tranart. If three spawn, it will, naturally, be all three. After the sprites are set loose, just press target on them and you will zap them with the Yaktwee stick. Doing so will transmute it into a charm slice which will come flying steadily towards you. 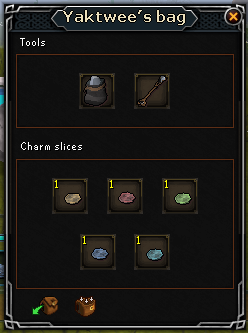 The charm slices come in the same colour as summoning charms: Gold, Crimson, Green, and Blue. There is also a special Mystical charm slice which can be used as any coloured slice. 5 slices can be made into one charm. If you do not have enough slices to make a certain charm, you can use mystical pieces to complete the charm. The main rewards from Charm Sprites are Hunter XP and Summoning charms. Your stick will keep track of how many you have caught. 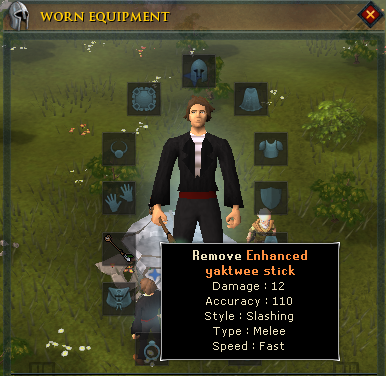 After 1,000 catches, a message will pop up alerting you to visit Yaktwee to upgrade your stick. The Enhanced Yaktwee Stick takes on a slightly improved look, and also earns a new benefit. When wielding the Enhanced stick, all Hunter XP you receive from any hunting activity is increased by 5%. Note some Hunter methods such as Falconry do not permit this. The enhanced stick might be a small bonus, but can definitely be worth obtaining if you are aiming for even higher Hunter levels, or even the fabled 99.